New Ditmars spot The Pomeroy opened tonight, launched by Bo O’Connor. As we mentioned yesterday, O’Connor was recently the private chef for her childhood best friend, Lady Gaga. So we shouldn’t be too surprised that Lady Gaga herself attended the opening. 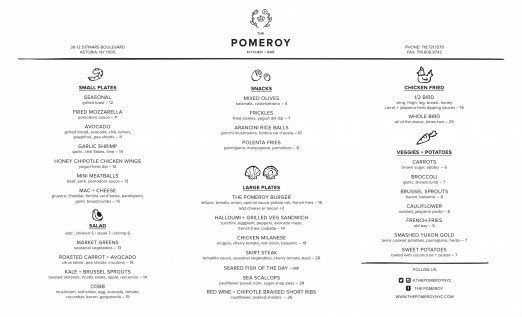 Check out The Pomeroy’s menu below and learn more here. Were you lucky enough to attend the opening as well? Share your experience in the comments! Lady Gaga is a woman very beautiful… very good articles that are in this blog, I am following this blog I find very interesting the subjects… thank you for sharing. It was hard to focus with all the Gaga frenzy since she was there all night (which was AWESOME, love her! )…but the food was awesome! We had the Ditmars Blvd and some other Astoria named cocktail and those were good (could have been a tad stronger). Food-wise we had the burger and the fried chicken. Burger was EXCELLENT tasting, totally fell apart, but definitely on par with Sweet Afton and Sparrow (Sparrow’s always gets the edge for me due to the fact that they actually stay together and the bun doesn’t get soggy). The fries were good, coleslaw was AWESOME, very fresh. Fried chicken was excellent as well, very juicy (could have been a bit more salty for my taste, but my boyfriend loved it as is), dipping sauces were nice as well, but it didn’t NEED it since it’s very good on its own. Looking forward to spending some (hopefully) low key nights here sipping cocktails this winter.